This is Ben Baecker’s tiny house for sale near Austin, Texas. You might remember it from early 2014 when it was up for sale for the first time. Fortunately, it never sold and Ben decided to keep it for a while longer. But today, it’s up for grabs once again in case you’re interested. Ben built it during his last two years of college but right now he’s enjoying life traveling out of the country living out of a backpack. Please enjoy, learn more, and re-share below. Thank you! Price is $12,800. 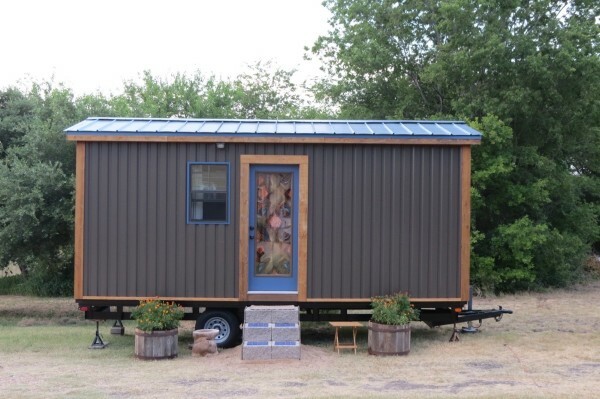 The tiny home is located near Austin, Texas. The design was originally based off of Jay Shafer’s Popomo tiny house. But we decided to change the layout and general appearance of it instead. It’s built onto a 8′ x 20′ flatbed over axle trailer that I purchased used. I had a welder inspect and re-weld the structure to prepare it for it’s new task of hosting the home. The entire axle, wheel, and braking systems are brand new with two 6,000 lbs load axles and travel trailer wheels and tires. The home itself is built exactly as you would build any normal house. Studs every 16″, windows and doors framed as usual, fully insulated and all. I built it to run off of a normal 3 prong outlet to keep it as simple as possible. And it’s off grid capable with a generator or if you hook it up to a solar system. There is no running water. The kitchen sink is gravity fed and drains into a bucket you can carry out and dump when needed. There was no need for me to build a bathroom since my shower and composting toilet were outside or in the neighbors house. However with the layout there is room to install one if you wanted. I knew in the future that I would sell it and didn’t want to take up the space with a bathroom when there are many other ways one could use the back few feet of the house. This micro house is located an hour north of Austin, Texas. If you’re interested in buying this micro house on wheels contact Ben Baecker [email protected]. Let him know you saw the listing on TinyHouseTalk.com. Our big thanks to Ben Baecker for sharing! Good job Ben! I like the cocoa and cobalt color scheme on the outside. The contact info did not work for me. The only thing I can suggest is adding doors or a curtain to cover the storage area under the bed. Great layout. I like it, but would prefer a loft and plumbing. However, I live in Michigan and don’t have a tow vehicle. Exterior is clean and looks well done, interior needs a woman’s touch. No wonder it did not sell. Poorly planned interior. I guess Darcy & Marcy think alike. I really find the exterior pleasing; clean, simple, homey. I actually like the rather boho interior. Except for the lack of a toilet and shower, and regular sink. I couldn’t prepare food in it as it is. And, as a female, the lack of a toilet is a deal-breaker. I can’t just step outside to pee.